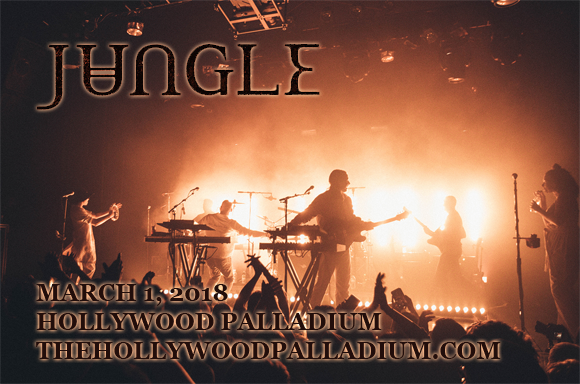 Get ready to groove to one of the funkiest acts you'll see this year, as British soul group Jungle comes to Hollywood Palladium on Friday 1st March 2019! A "must-see" live act, this full-throttle collective knows how to get down, and they have fun doing it! With a set choc full of hot new material, Jungle can and will make you dance like there's no-one watching! English modern soul collective Jungle formed in London, England in 2013. Evolving from a duo to a seven-piece band, the group has a 1970s funk-influenced sound and an emphasis on multi-disciplinary arts. After the release of their debut single, the band was picked for the BBC's Sound of 2014 prize in December 2013, and went on to play South by Southwest festival, Jimmy Kimmel Live! and Glastonbury festival the following year. 2014 also saw the release of the band's self-titled debut album, which was shortlisted for the 2014 Mercury Prize that September. The group's follow-up album, For Ever, is released in September 2018.